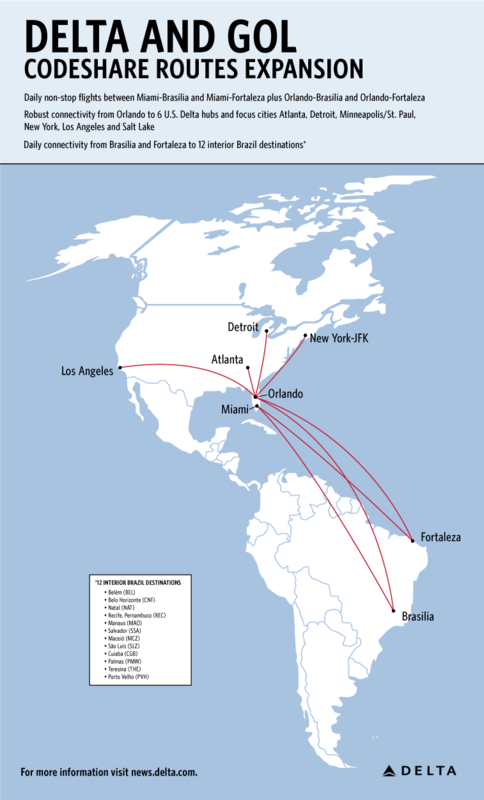 Delta Air Lines and GOL Linhas Aéreas Inteligentes SA announced four daily non-stop codeshare flights connecting Miami and Orlando with Fortaleza and Brasilia. "This is the most significant expansion we have done with GOL since last year, when we announced international codeshare in South America, and it is the next step as we grow our alliance partnership," said Luciano Macagno, Delta's Managing Director - Latin America and the Caribbean. "Codesharing on these flights shows our commitment to Brazil and to Florida and our desire to offer our customers more access between Northern Brazil and the U.S."
Customers traveling to Orlando from Brasilia and Fortaleza will be able to connect to six of Delta's domestic hubs as well as several focus cities, providing access from coast to coast with flights to Los Angeles and New York as well as to Detroit, Minneapolis-St. Paul, Salt Lake City and to Delta's headquarters city, Atlanta. "We are excited to connect our capital and Fortaleza to the U.S. with Delta as our partner," said Celso Ferrer—GOL's Vice President - Planning. "This network expansion enhances a successful alliance focused on providing our customers improved services, more options and the best experience in every step of their journey." The Brasilia and Fortaleza hubs provide connectivity to 12 destinations in the interior of Brazil, including Belem (BEL), Belo Horizonte (CNF), Recife (REC), Natal (NAT), Manaus (MAO), Salvador (SSA), Maceió (MCZ), São Luís (SLZ), Cuiaba (CGB), Palmas (PMW), Teresina (THE), and Porto Velho (PVH). DL7600 BSB-MCO 9:50 a.m. 2:50 p.m.
DL7748 BSB-MIA 9:50 a.m. 2:25 p.m.
DL7654 FOR-MCO 8:35 a.m. 2:25 p.m.
DL7732 FOR-MIA 8:35 a.m. 2:05 p.m. The route will be serviced with GOL's Boeing 737 MAX 8 aircraft. These aircraft feature 186 seats and GOL+Conforto spaces, which have up to 34-inch pitch and up to 50 percent greater seatback recline than a standard economy seat, as well as GOL Premium class on all international flights. In addition to the codeshare expansion to Brazil, the airlines announced last year their international codeshare in South America, where GOL began offering codeshare flights between Santiago, Chile, to other destinations served through the partnership with Delta, providing customers from both airlines with increased travel options to and from the United States and South America. The airlines have also modernized their aircraft cabins, making considerable investments to provide benefits such as premium seats in the main cabin— Delta Comfort+ and GOL+ Comfort, as well as onboard Wi-Fi on Delta's entire long-haul international fleet and on an increased number of GOL's flights. Delta and GOL continue to improve the customer experience through digital offerings like Delta's groundbreaking wayfinding map feature in the Fly Delta App, which now includes a map of the Guarulhos airport, and GOL's Selfie Check-In. Delta and GOL have worked diligently to provide customers the best service throughout their journey, including joint sales channels and single check-in at airports, an enhanced experience at Delta and GOL airport VIP lounges throughout the network, and reciprocal benefits to Delta's SkyMiles and GOL's Smiles frequent flyers programs, allowing customers to earn and redeem miles on eligible flights. Since the alliance between Delta and GOL started nearly seven years ago, the airlines provide access to 99 percent of the destinations in Brazil. Today, the airlines have more than 330 codeshare flights together, to more than 321 destinations in nearly 60 countries. A third of the passengers that fly Delta (from Brazil) to the United States start their travel with GOL. Delta's capacity to Latin America is up 41 percent versus a decade ago, significantly outpacing competitors, and Delta is the only major U.S. global carrier to fly more flights to Latin America than it did a decade ago.